For more information on the various HRIF reports or for a tutorial on how to use them, please contact Erika Gray, HRIF Program Manager. More information on other reports available through CPQCC can be found on the NICU Reports page. The HRIF Reporting System includes reports designed to help HRIF clinics and NICUs turn data into action. The Summary Reports provide an overview of the patients registered and receiving follow-up services in an HRIF clinic. The HRIF Summary Report includes data the individual patients seen and followed by an HRIF clinic, regardless of where the infants were born or discharged from. The NICU Summary Report includes data on individual patients that a NICU has referred for follow-up care, regardless of the location where they are receiving their follow-up services. These reports are updated in near real-time, allowing sites to access information about their successes and challenges; make comparisons across the state, and identify opportunities for quality improvement. The Demographics of Patient table provides HRIF clinics with detailed information on their particular patient population in comparison to all other HRIF clinics in the state. 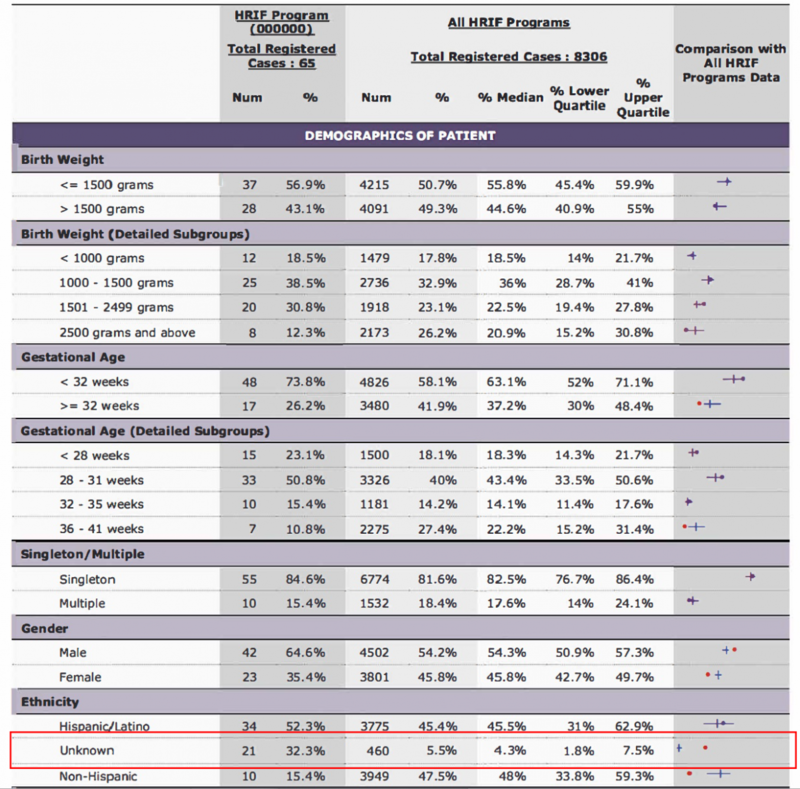 In the report below, 32% of this HRIF clinic’s patients are coded as race “unknown” as compared to only 5.5% across all HRIF clinics in California. Identifying these gaps can present programs with valuable opportunities to explore potential areas for improvement in both the data they collect and the care they provide. The Follow-up Status Table allows HRIF clinics to track the quality of their follow-up care in relation to all other HRIF clinics in the state and identify areas where they are performing better or worse than average. The HRIF clinics below is seeing 7% fewer patients than the state average and 10% more cases are closed prior to the patient’s scheduled visit. 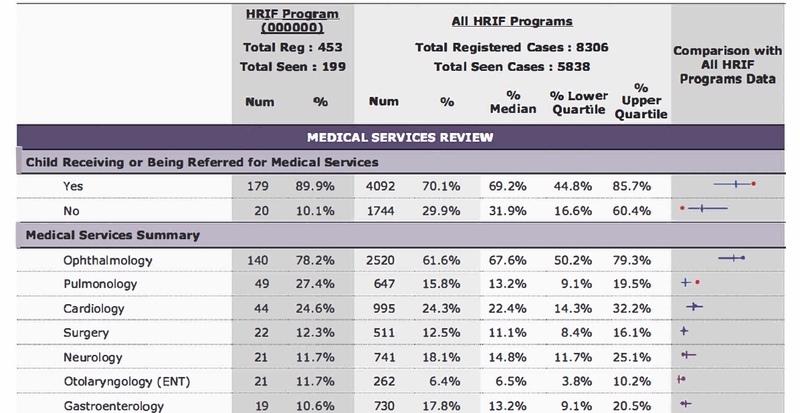 The Medical Services Review Table provides detailed information on the medical services provided to a particular HRIF clinic’s patient population, either directly by the clinic or through a referral. This report allows an HRIF clinic to better understand the specialty services their patients require and allocate resources accordingly. The program below referred more patients to a medical service than the state average. 80% of referrals were for ophthalmology whereas only 25% were for cardiology.